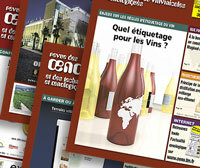 In 1972, a team of Burgundy-based oenologists, led by Charles QUITTANSON and Michel BILLY, founded a news bulletin. Over the years, this bulletin has evolved into the "Revue des Œnologues", a meeting ground for engineers, oenologists, winemakers, grape growers and other wine and grape professionals. Part of the Centre de Promotion des Arts et Métiers de la Vigne et du Vin (Centre for the Promotion of the Art and Craft of Grape-Growing and Winemaking), the Revue des Œnologues has a staff of 10 as well as numerous correspondents throughout the world. The journal publishes a wide array of articles and freely expresses its opinions on grape- and wine-related subjects. Quarterly journal plus one special supplement per year. Outside France: 6,000 in 59 countries. Founded in 1973, the Revue des nologues is published by the OENOPLURIMEDIA company.